Just thought I would post the Birthday Card for my Brother-in-law (which is also my challenge submission for the StampNation Birthday Bash Celebration (Masculine Birthday, BB12)) that I made today. I used Alcohol Inks on glossy white card stock to create the background. The Tim Holtz/Stampers Anonymous, Bird Crazy image was also stamped on an Alcohol inked panel and then embossed with black embossing powder (image then die cut from the coordinating Bird Crazy thin die). I colored in parts of the owl with #coloring Alcohol markers. 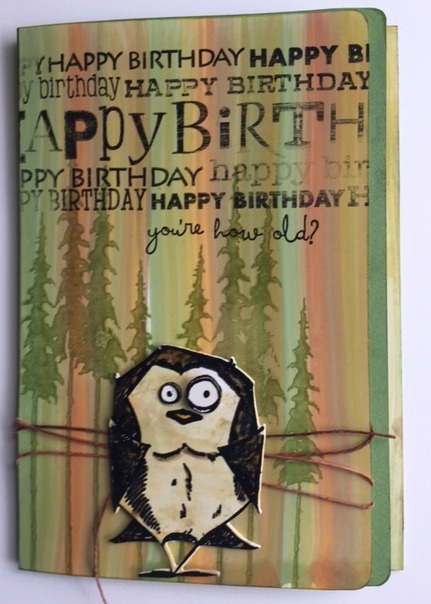 I finished off the card with some twine (that I colored with Alcohol Ink to match the card) and dimensional tape to for the Crazy Bird image. Hope he will like this card and appreciate the humor in getting older!